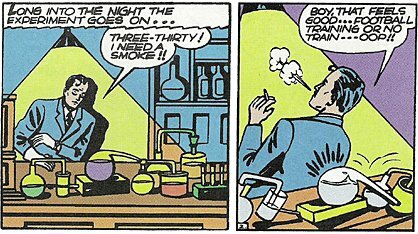 The hard-water fumes thing has always been among the worst of the speedster origins, imo – cig or no cig. I’d love it if they’d update it some kind of water. Speed Force by way of water-in-beaker just doesn’t have the same oomph. 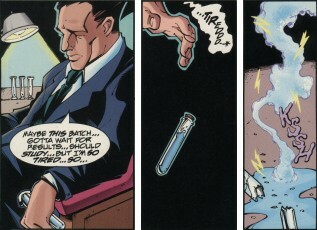 But yeah, of DC’s speedsters, this one makes the least sense, especially since they named the substance involved. If hard water gave people super-speed, everyone in my city would be running around at Mach 2! I’ve heard it suggested that maybe they meant to write “heavy water,” which at least would fit (if a bit early) the “radiation can do anything” concept so popular in the 1950s. And actually, the Flash Secret Files version tacked on an explanation that he was trying to add radiation or high-speed vibrations to the water in the panels immediately before the ones I scanned. Okay. You got me, there. Radiation or high-speed vibrations? *shrugs* I’ll take it! Anything Just about anything is better than mongoose-blood. Wait! Maybe it was radioactive, high-SPEED mongoose blood! I’m now picturing a mongoose zipping around an atomic nucleus, chittering in a Flipper-esque sort of way. Funny thing on that water labeling thing… Grant Morrison actually used the concept in an issue of Seven Soldiers: Frankenstein. A government project tried to use the technique to turn water into a weapon. The water didn’t like it, and fought back. For my money, as interesting as the differences in the smoking habits are, the differences in the flasks are even spiffier.